We strive for excellence! Rest Assured at any of our member properties! 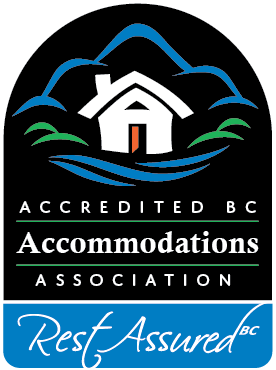 Accredited BC Accommodations was formed in 1993 as the Western Canada B&B Innkeepers Association, renamed in 2007 as the British Columbia Bed & Breakfast Innkeepers Guild, and now, in 2018, to Accredited BC Accommodations. Our members are all independent B&B innkeepers of British Columbia, or providers of self-catering accommodation. The Association is a professional Association of licensed, quality B&B innkeepers in BC, or licensed self-catering hosts, formed for education, marketing and representation purposes. Member inns must pass our Quality Assurance Inspection Program in several areas: guests’ safety and security, property cleanliness, housekeeping, food preparation areas for those offering the full Bed & Breakfast experience, and hosts’ attention to service and hospitality. Each individually owned and operated member Bed & Breakfast promises you personal service and attention to detail, ensuring a memorable stay. Each individually owned self-catering host offers you privacy and clean and comfortable accommodation to enhance your stay in BC. Our members can also recommend other members, so you will be guaranteed excellent accommodation throughout your journey in British Columbia. We feel so strongly about striving for excellence in hospitality that, since 2002, we have recognized member innkeepers who best exhibit hospitality, and who best promote the concept of hospitality. Nominations for the Moyra Turner Hospitality Award require affirmation of exemplary hospitality by guests or other Guild members. Moyra Turner was a much loved and respected founding member, who gave effortlessly to her guests and fellow members. Never seeing the glass half-empty, she was a caregiver who lived to please those around her. Moyra passed away from cancer in 1999, but will live forever in our hearts, and has set an example for us all.